I had a funny exchange the other day on Facebook. There was a link about the dangers of the cheese powder in boxed mac and cheese. I commented on my friend’s post that when we can, we should rely on whole foods to make mac and cheese. Being an American, my friend thought I meant the food chain Whole Foods, which is not so cheekily known as Whole PayCheque for the high cost of it items. 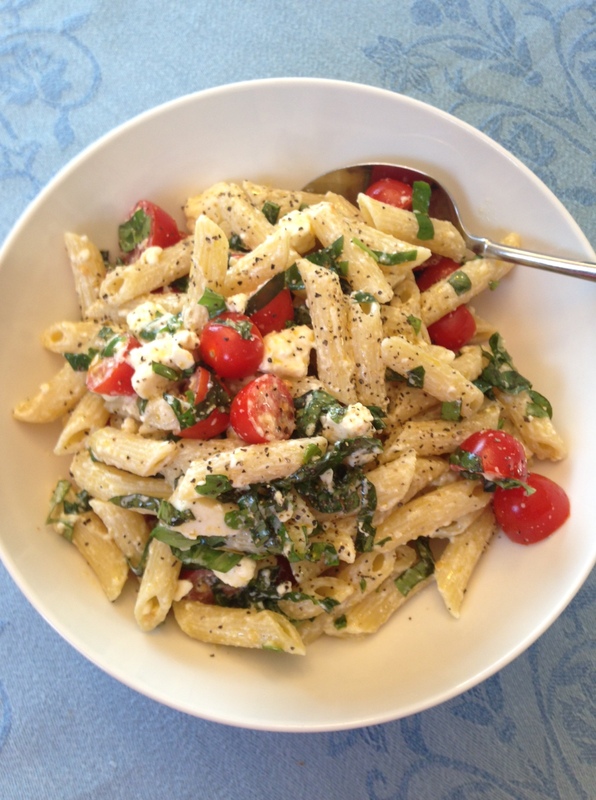 Not macaroni and cheese, but my favourite feta, basil and tomato pasta supper. Nonetheless we had a good chat about how expensive it can be to eat whole, unprocessed foods, and that led us to a whole other thread about clean eating, healthy eating, good foods, bad foods, cheat meals, etc. We weren’t actually talking about our approach to nutrition but the way the words we use to talk about food get co-opted by all kinds of agendas. It’s quite easy to have all sorts of “isms” and attitudes creep in, altering our meaning and twisting our understanding of food as fuel in our lives and how we relate to it in different contexts. That same day SamB brought my attention to this article about Anthony Warner, described by the Guardian as “(the Angry Chef) who is on a mission to confront the ‘alternative facts’ surrounding nutritional fads and myths.” Warner writes a blog on food fads, and he doesn’t hold back. He’s now written a book called The Angry Chef: Bad Science and the Truth About Healthy Eating, and I ‘m adding it to my reading list. That’s because when you start a fitness program, there’s all manner of advice on how to eat, what to eat, and why the one true way (insert your favourite fad — howsoever you define it — diet here) will be all that you need. Even if your goal is not weight loss, there’s all kinds of recommendations (cough, cough, rules!) on how to eat to train. Heck, you don’t even have to be training to get food advice. I’m convinced all you have to be is female and not meet someone’s pre-conceived notion of how female should look, for the advice to come pouring in, accompanied by a generous helping of side eye finished with a soupcon of shade, if the advisor deems your food choices not to meet their definition of “healthy” eating. What appealed to me about Warner is his evidence-based approach. In the article he says: “A lot of the clean-eating people, I just think they have a broken relationship with the truth. (…) They’re selling something that is impossible to justify in the context of evidence-based medicine.” I like science and research and critical thinking. Sadly, there’s too little of it when it comes to talking about food and part of it goes back to the agendas behind the particular terms used. And he’s right. The people who have preached to me about gluten free diets when they aren’t celiac are utterly convinced of the rightness of their belief that going gluten-free cured their ills. Equally certain are the people who now look upon sugar with the same fear and revulsion we bring to edible oil masquerading as coffee creamer. Excuse me now, as I forage in the fridge for the leftover maple syrup glazed salmon. — Martha is a writer and powerlifter in training exploring a whole new world of food as fuel. As a cancer survivor, I definitely have developed a “sugar is the devil” attitude. Maybe not at a “Sugar Blues” or “You Are All Sanpaku” level, but I’ll never quite think of it as a harmless indulgence ever again. As someone who also exercises, I understand the function of glucose, and I use those Stacy Sims-based hydration powders when on a long ride. I even drank them when my blood cell counts were low during treatment. But I don’t think I’ll ever sit down to a big piece of cake again and truly enjoy it. Thanks for sharing your perspective commongrounddog. I’m not a lover of supersweet goods, and in fact, find most North American sweets inedible compared to European ones. I’ve avoided hydration powders as a rule because they remind me too much of the glucose drinks I had to take when pregnant to check for possible gestational diabetes. I’ve had better luck recovering if I take a shot of pure orange juice. How did you find the powders with respect to stamina? I feel Stacy Sims has put a lot of real science behind what she’s done and it shows – Skratch Labs, Osmo, and now Nuun Performance have gained a lot of followers. I’ve noticed that 1. When it’s very hot and the ride is long (50+ miles/80+ km) no other product has come close to keeping me pretty comfortably hydrated, and 2. I’ve never had stomach upset from her products, as they are designed to contain minimal glucose, but maximum osmolality (high absorption rate into cells). I tried posting this, but I don’t know if it went through. I apologize if it shows up twice. I have changed how I’m eating, but my focus is not whether or not the food is good or evil, but how I feel after eating it. And I firmly believe that what is “healthy” for someone else, may not be healthy for me. Food, just like clothing, is not one size fits all. Our bodies have different reactions to different foods, and no two bodies are guaranteed to have the same reaction. I recently tried an elimination diet to help determine if there were certain foods that made me feel worse than others. Following the period of elimination as I was re-introducing foods back in, I experienced an allergic reaction to something, and I’ve now decided it’s time to be tested so I can scientifically determine what foods I should avoid. My goal is not to see the foods as good vs evil, but rather as not healthy for me to eat. It’s taken me a very long time to reach this point because we are constantly bombarded with contradictory information that this food or that is a superfood we must eat or an evil we must shun. Even after my allergic reaction (face swollen like a balloon, major hive breakout), I still don’t regret eating what I suspect is the culprit food – a slice of birthday cake. Why? Because I was helping a friend celebrate her 40th birthday, and she’ll only turn 40 once, and it was a delicious piece of cake. No guilt. No shame. No moral judgement. I have been a food zealot and anti sugar crusader in the past. I have let that go. I try to eat foods that make me feel good. I have celiac disease and IBS. I have a strong fear of food making me sick. Over the years I have learned that we are all different and that what works for me might not work for someone else. Thanks ainsobriety! That’s always a useful lesson — what works for me may not work for someone else. I’m happy when someone finds something that makes a difference to their well-being. It’s the assumptions that this discovery will apply equally to all peoples that I struggle with. What helped you let go and redirect your focus on your own health? I was diagnosed with celiac disease after a biopsy. I realized why my low carb diet had helped my stomach issues…it was fairly gluten free. Suddenly things made sense for me personally. With zero gluten I can eat dairy (even some ice cream) and fruit and feel good. For me, I think because I have dealt with health issue since close to the beginning of adulthood starting with PCOS – diagnosed in 2000. Multiple Sclerosis (2009) and chronic, late term Lyme disease. Add hypothyroid, MTHFR and SIBO to the mix, I can’t help but to think how food affects me and my body on a daily basis. I know if my food has been “contaminated” with some of the things I must avoid, and a setback is not worth it to me. Food and fitness is one reason why I am able to get out of bed in the morning despite my health where a lot of my peers in suffering are having a hard time with basic life. I also can’t help but to think the SAD I grew up on played in role in how my body responses to food and medication. Maybe not 100% but I sure it was a factor. Self knowledge is so important to developing and maintaining health. Thanks for sharing your experience barose! LOVE love love this post. A balanced diet is the best kind of diet. I’ve tried paleo, weight watchers, etc. Those diets are full-time jobs and make you feel so guilty for ever having a cheat meal or day. Certain diets take the joy out of enjoying meals. And you’re so right to say that a lot of health foodies teach us that sugar is toxic…we actually NEED sugar in our diets, the natural kind, but sugar nonetheless. That is so true catnrat. When I met with a dietitian to answer some questions I had, one of the first things I had to put on the table was my need for chocolate and for tasty food. I cannot abide rice cakes after an ill advised experiment in my youth! Thanks for your insights. Thank you for this post, really great. It’s when a Dr. on a talk show talks about the body needing this or that, that I want to write…but I try to be aware because a Kidney Stone diet throws whole wheat, almonds, spinach and berries (oh and much more) out of the list. If a doctor wants to put me on a loose weight diet, it won’t be commercial, it will have to consider certain factors. It’s the “know-it-all-this-is-best-and-you-should-change-your-habits because…” folk that drive me nuts. Does food make me happy? Yes. Do I indulge to make it that way yes. BUT it’s not the food, it’s me and my attitude or feelings that moment or day in time. It’s a head game as well. Ooh this is gonna go on my reading list! Great post. I’ve had issues with food, my body, my health and been utterly confused about what I should put in my mouth to heal and not harm. What I’ve discovered is that if I listen carefully my body tells me what it needs and if I listen even closer I will also hear why I’m eating; not always for nourishment, but that’s ok. With all of these movements, clean eating, everything that tastes good-free diets there is a danger that what it grows is judgement; towards ourselves and others. So I’m up for cultivating the ‘don’t know’ mind and trying things out and listening to our bodies/thoughts/feelings. An illusion of certainty is comforting but then so is a hot chocolate brownie and cream. What’s also true about what you say is that we use language that villifies food/ some organisations using a variation of the word sins to point towards sugary foods and dieters equating ‘having a good day’ to consuming as little as possible. I’ve done it. For me having a good day is not what I haven’t eaten but what I have been truly present for eating, what I’ve enjoyed, nourished myself with without mindless munching. You raise so many good points- let’s all try to change the language around food choices. Let’s all try to be a bit kinder to ourselves and to those who choose differently from us.